Whiplash is often seen as a minor injury following a car accident or fender-bender, but it is actually much more serious than people think. It is important to seek out professional care immediately after experiencing symptoms of whiplash or being involved in an automobile accident, because the long-term effects of untreated whiplash can have a serious, negative health impact. Picture this–you’re in a car accident and although you don’t see any visible injuries, a day later you start to get a neck twinge. You decide it’s probably just a sore neck and decide to rest, but don’t seek any professional treatment. The neck pain gets worse day after day until it’s debilitating, and your condition is much worse that the initial pain and injury of whiplash. Regarding medical care and recovery, one size does not fit all, and rest alone may not be enough to recover from whiplash. Each treatment plan and recovery period depend on the severity of the whiplash injury, which is why seeing a professional to diagnose and care for your whiplash is so important. Whiplash is a soft tissue neck injury resulting from forceful, rapid back-and-forth neck movement, imitating the cracking of a whip–which is where the injury gets its name. Whiplash occurs most-often during rear-end auto accidents, but the injury can also result from playing sports, physical abuse, or other neck or head trauma. Common symptoms of whiplash include neck stiffness, soreness, pain, and recurring headaches. If you begin to feel soreness in your neck and shoulders, or pain in your back, it may be a sign of Whiplash. Most people with whiplash get better within a few weeks by following a physician-approved treatment plan. However; if left untreated, some people have chronic neck pain and other long-lasting complications that can seriously affect their health, work, and day-to-day lives. 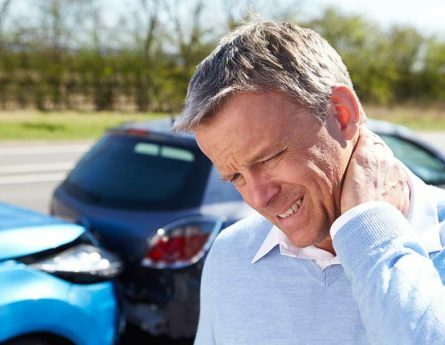 Whiplash is a common result of auto accidents and chiropractors and physical therapists are trained to treat it. In car accidents, the force of the vehicle that hit you may have also misaligned your spine causing extreme pain or soreness in your neck and back. It may also surprise you to learn that physical injuries such as blunt trauma to the head from sports (such as football, boxing, and other physically intensive or combative sports) can cause whiplash as well. Whiplash can even result from jerking neck movement and intensive neck strain. If your work involves awkward neck movement or abrupt head or neck alignment changes, you are more prone to getting injured from whiplash. Adrenaline and shock can mask pain during and immediately after a car accident or physical injury, so whiplash symptoms should not be ignored in the days to weeks following an accident. Musculoskeletal injuries, including whiplash, often show symptoms days or even weeks after a car crash. When dealing with whiplash symptoms, it’s important to consult with a physical therapist or chiropractor as soon as possible. Even if you are not currently exhibiting symptoms after being in a car accident, you should still be seen by a certified chiropractor or physical therapist to check for possible injuries and prevent chronic pain or complications down the road. Untreated whiplash can lead to serious, negative health conditions and long-term pain. Torn or overextended muscles and tendons in the neck can limit range of motion and place pressure and stress on the neck, shoulders, head, and spine. In fact, according to a study published in the medical journal Neurology, 7.8% of study participants “had not returned to [their] usual level of activity or work” after one year due to whiplash injury symptoms like pain and stiffness. In addition to neck and head injuries, whiplash can affect the brainstem and spine as well. These symptoms can turn into full-blown health conditions if not properly treated in a timely manner. Each case of whiplash injury is different and requires specific care, but the advice to sufferers is the same–seek professional care, or risk injuring yourself even further. Untreated whiplash poses an increased risk for chronic pain and soreness, long after the injury or car accident occurs. Torn or stressed neck muscles and ligaments require careful treatment and take time to repair correctly. Over-exerting these muscles and ligaments can make matters worse, causing chronic pain, soreness, and difficulty performing regular tasks or movements. While most whiplash patients see improvement in their condition within several weeks or months of the injury, for those that do not seek treatment, chronic pain and discomfort can persist for several months and even years after sustaining the injury. Pain and stiffness from whiplash or a neck injury can cause loss of mobility that prevents you from being able to perform your work duties or common daily tasks. Inflammation and swelling in the neck, upper back, and head muscles, which can make it very difficult to move those sensitive areas or fully turn or crane the neck or head. If left untreated, neck pain can progress and cause secondary conditions such as headaches, migraines and shoulder pain that radiates into other areas of the body. Chiropractors and physical therapists provide integrated therapies for shoulder and neck symptoms of whiplash from car accident and other injuries, such as chiropractic adjustments, massage therapy, rehabilitation exercises, and more options depending on the degree and location of the pain. Headaches, including Cervicogenic headaches, are common after whiplash injury, with pain radiating from the neck to the forehead and back or sides of the head. Chronic headaches and radiating pain or pain occurring at the base of the skull may flare up immediately after whiplash or in the days to weeks afterwards and can become worse without treatment. Neck pain may radiate through the back, upper shoulders, head, and vertebrae, causing pain and soreness that trigger debilitating headaches or migraines. Headaches that persist for several months after sustaining a whiplash injury are usually attributed to that injury and usually require medication and physical adjustments or treatments to resolve. A blow to or sudden movement of the head which causes neck strain and whiplash can also result in a concussion. Neurological symptoms can arise as a result of untreated whiplash or a concussion, such as weakness, difficulty talking, confusion, dizziness, nausea, and excessive tiredness. Whiplash often causes the uppermost vertebrae in the neck to move out of proper spinal alignment, limiting an individual’s range of motion, inciting damage to these vertebrae, and even skewing normal posture. The atlas (C1) and axis (C2) vertebrae form the joint connecting the skull and spine, and misalignment of these upper two vertebrae inhibits normal communication from the brain to the body’s central nervous system. These vital communication signals that move between the brain and the body can be negatively impacted or even impaired by vertebrae misalignment, especially since the atlas (C1) and axis (C2) vertebrae have the widest range of motion and are the most vulnerable to whiplash motion injury. Untreated whiplash can have serious long-term effects, even contributing to Degenerative Disc Disease–a condition that occurs when discs between the vertebrae of the spinal column deteriorate or break down, leading to pain, weakness, and numbness. Severe whiplash may tear fine muscles in the neck or upper back and contribute to the dislocation or herniation of the upper cervical spine. The trauma from untreated whiplash can trigger symptoms of Degenerative Disc Disease that previously went unnoticed, such as upper back and lower neck pain, difficulty in stretching or moving the back, and less flexibility and resilience to day-to-day wear and tear. Discs between spinal vertebrae usually act as shock absorbers and help flex and bend the back, but with Degenerative Disc Disease, these discs are worn down and offer less protection from injury and movement. A Physical Therapist or Chiropractor can perform an exam to recognize the signs and symptoms of whiplash and create an individualized treatment plan for your recovery, usually involving some combination of pain medication and targeted exercise. The goal of whiplash treatment is to control existing pain, restore normal range of motion in your neck and injuries areas, and get you back to an active, normal state. At RxWellness, experienced physical therapists and chiropractors conduct thorough medical evaluations and x-rays to make sure a pressing medical emergency isn’t at the heart of your problem. Don’t take chances with your health, make an appointment with RxWellness or contact us today at 703.904.9666 or visit us in person at 950 Herndon Parkway, Suite 130, Herndon, VA 20171.